Assessments of Forklift operator's skills in their normal working environment. This would supplement their stipulated refresher frequency e.g. Company policy three yearly refresher, however an onsite evaluation of drivers would be carried out yearly to highlight areas of concern and to correct bad practices picked up since last formal training. To provide on site assessments of Forklift operator’s skills in their normal working environment. This would supplement their stipulated refresher frequency e.g. Company policy three yearly refresher, however an onsite evaluation of drivers would be carried out yearly to highlight areas of concern and to correct bad practices picked up since last formal training. The instructor would assess the abilities and techniques being used by the operator to ensure that they still meet the ITSSAR requirements. He will provide verbal feedback and some coaching if required to the operator and an evaluation sheet and recommendations to Supervisor. Separate certificates are required for counterbalance and reach trucks due to different operating characteristics. A 1day course is available for operators who require a re-test or familiarisation for a different machine (conversion course). 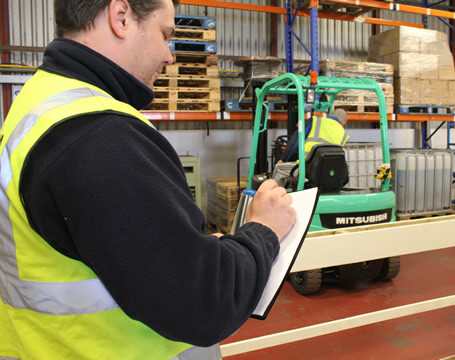 Operators are required to supply Evolve with a copy of their current forklift certificate, prior to the course commencing.